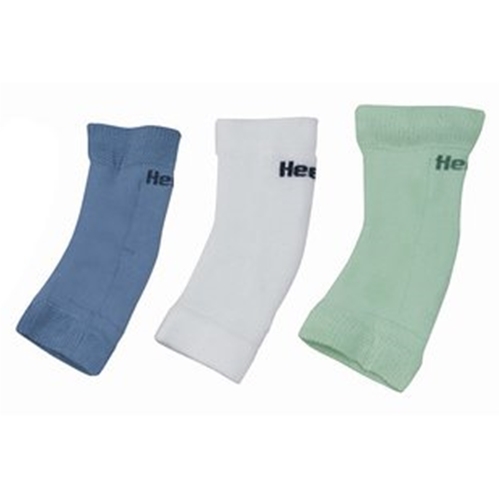 Heelbo Heel and Elbow Protector Pads from HealthyKin.com helps reduce shear and friction to heels and elbows while allowing skin to breathe. Sizing based on heel/elbow circumference at the largest point. Sizing runs small and the product is designed to fit tight. If you are between sizes choose the larger size. Elbow protector works great! Previous comments about size running small is true. I have slender arms and bought he large size which fits very snug. These arrived within a day of ordering them. That was great! I am glad I ordered the larger size. Our son is smaller but the large pads fit him about right. Bought large heelbo for my husband who is not a big guy but it was too tight. It was even too tight for me, and I only weigh 118 lbs. Once we got the right size, the product does exactly what we want it to do. They run on the small size. We received them in 2 days. Thank you! I ordered the med. set for my grandson who is in a wheelchair. He weighs under 100 lbs and they fit him. Thank you! There are great for my elbows. this is the second time I got them. will buy again good quality elbow pads. I ordered the X-Large and it was tight! If Heelbo made the fit better, this would be a perfect product. I don't think I'll order this again unless that happens. Exactly as promised and ultra comfortable. Easy to clean and maintain, Exactly what the doctor ordered for my Cubital Tunnel problems!